I was glad to get 3 more ‘baby’s” vaccines, including DPT. I may get one more in August; maybe some of the live vaccines next spring if my immune recovers enough by then. They are hesitant on giving live vaccines even then as there is a 50/50 chance of contracting the disease. Along with the ‘baby’ stuff, I continue to require my preschooler naps to contend with lack of strength and endurance, though that too is slowly improving. I had completely underestimated the impact of the disease on my body and the time it would take to recover. They say it is common to take 2+ years to recover from this type of Leukemia and transplant operation… or to find your new ‘subnormal.’ The seriousness of the transplant is deceptive because the infusion of stem cells was so routine; it seemed just like one of my 30 some blood transfusions. (Thanks everyone who give blood on a regular basis. It really DOES save lives!) But the process of destroying your entire immune system <think Galatians 2:20 and 2 Corinthians 5:17> is a major deal. It’s a journey of enduring patience and trust. As good as all the reports are, they want to continue to keep close reins on me. So no letting up on the frequency of labs and treatments or the current med regime to keep Graft Versus Host Disease (GVHD) at bay. I will also continue regular pulmonary treatments to reduce the chance of lung infection. God is good all the time, and we are pleased to wait on His perfect plan in and through all of this. Isn’t that true of each of us, whatever journey we are on?! I am not remiss in remembering the pain others are going through. Except my friend Bob who lost his AML transplant battle recently. Now in heaven, he is doing better than ALL of us! Please pray for his dear wife, Betty. Thanks for your continued prayers. Live life fully each day while time remains! This entry was posted in Faith, Leukemia/Cancer and tagged 2 Corinthians 5:17, cancer, cancer brain, Galatians 2:20, God is good, Graft versus host disease, GVHD, Leukemia/Cancer, Live life fully while time remains, medical update, vaccines after Leukemia on June 30, 2014 by Bryan Thayer. I am an overcomer and more than a conqueror. God is with me so who can be against me? I am a child of the one and only true King who loves me with an everlasting love. I can press on and have hope because my God is always faithful. 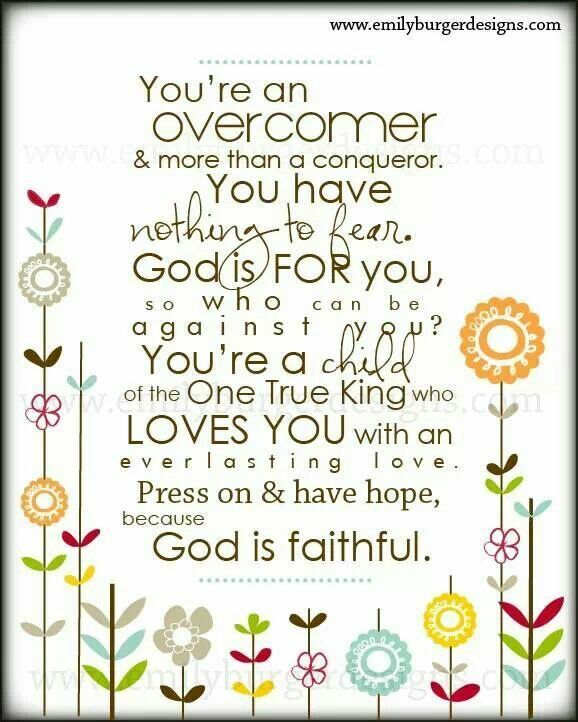 This entry was posted in Faith, Living With Purpose and Passion and tagged child of God, God is faithful, God is for you, Hope, nothing to fear, overcomer, press on on June 28, 2014 by Bryan Thayer. For me, the song is about more than civil rights; it was about overcoming the oppression inside each one of us; to get beyond struggling against difficulties and disadvantages. Do YOU want to be an overcomer? Do you want to conquer your fears and frustrations? Do you want to break out of whatever difficulties are holding you prisoner? God’s Word says that we ARE overcomers. How can that be possible? Can we rid ourselves of pain and remove ourselves from sorrow? Can we guarantee our success in all ventures? No, but we can rise above our circumstances. Though they remain around us, they don’t have to remain within us. We break free of the oppression of our circumstances by standing firm in God’s presence and in belief that His Word is true; that He WILL complete that which He has started in us, that He will NEVER abandon us (no matter how we feel at the time); He WILL give you a supernatural peace if you will just claim it. He can promise these things because He already has overcome the world. It may not seem like it in this present chapter of our history, but His Story has been written; and in the end, GOD WINS! Isn’t it time to start being the overcomer you are meant to be? This entry was posted in Faith, Living With Purpose and Passion, Memories and tagged beyond circumstance, civil rights, i have overcome the world, John 16;33, Luke 1:37, Nothing is impossible with God, overcomer, we will overcome on June 27, 2014 by Bryan Thayer. Paul writes, “I press on toward the goal to win the prize for which God has called me heavenward in Christ Jesus.” (Philippians 3:14) It is our calling too, you and me. I don’t know about you but a lot of the time that race seems like a marathon or a triathlon. Ironically, those human challenges, while impossible for me in my condition, are minor endeavors compared to the race of life that you can and must run; it is much longer and sometimes more grueling. It’s a race where I’ve fallen down numerous times. You too? It can be easy to get discouraged in those times. The feeling of giving up is strong. But we can’t give up. We have to press on. We have to get up and keep on running. Why? First, we are commanded. The only thing we are told to do once we put on the armor of God is to stand and stay standing, praying at all times in all things. You might not be the strongest warrior, the fastest runner, the most talented at anything, but you can stand. The promise of God attests to it. Never give up. Keep running your race. Jesus gave you His Spirit to make sure you can endure! Trust Him. This entry was posted in Faith, Living With Purpose and Passion and tagged Matthew 10:22, Never give up, Philippians 3:14, press on, Run the race, Trust God on June 26, 2014 by Bryan Thayer. Have you ever been in a situation and later realized that God was present? We shouldn’t be surprised. David concluded: “If I go up to the heavens, you are there; if I make my bed in the depths, you are there.” (Psalm 139:8). Paul concluded that there is nothing nor any place that can separate us from God’s love (Romans 8). What if instead of finding ourselves thankfully surprised by God’s presence in our lives, we decided to live by inviting and expecting Him to show up – just as He promised? Not in the sense of Him stepping in to prevent us from any discomfort that might come our way, but in expecting that the God who sent his Son and offers us His Spirit, will indeed be with us wherever we go. Before Jacob’s dream would be realized, he would he would face much trouble. But in the end, God’s promise was fulfilled. And it will be with us too. Jesus said to His followers, “I am with you always. I will send you a counselor.” Regardless of our circumstance, we can claim that same promise. Instead of leaving God at the end of your morning devotional, go with Him throughout the day. I wonder how many reasons you can find to thank Him throughout the day. Expect His presence to guide you and usher you into his peace, whatever circumstances you face. This entry was posted in Faith, Living With Purpose and Passion and tagged Expect God to show up, Genesis 28:6, God's presence, Jacob's dream, Jesus, Nothing can separate us from God's love, peace, Psalm 139:8, Romans 8, Surely the Lord is in this place, Wherever I go God is with me on June 25, 2014 by Bryan Thayer. Do you ever talk to yourself? It can be a healthy thing to do, especially when you find your feelings are at odds with what you know to be truth. You feel like giving up but you know better to press on. You feel all alone but you know that God will never leave you. You feel unloved and yet you know the lover of your soul is always faithful. Put your enduring hope in who God is, not just in what He can do. Live a life marked by his great faithfulness. This entry was posted in Faith, Living With Purpose and Passion and tagged 2 Corinthians 6:4 and 10, body soul and spirit, Enduring hope, faithfulness, God knows the way, God will guide you, Hebrews 13:15, Hope in times of trouble, Psalm 42:5, Psalm 73:24, Sacrifice of praise, Talking to yourself on June 24, 2014 by Bryan Thayer. We went out early to start harvesting the Nanking cherries. Loaded with tasty red berries, they will bring an abundant crop for making jelly. It will take a while to pick them all as the ones in the shade ripen more slowly than the ones in the sunlight. Isn’t that the way it is with us? The more we are exposed to God’s light, the better we develop and mature; the more we mature, the more abundant our life becomes. Jesus says that the enemy comes to steal, kill, and destroy but He has come to give us abundant life. What is this abundant life? Is it one filled with the blessings of good health, riches, lots of friends, property, fame, and success? Sometimes, these do come to the faithful; we see plenty of examples of such temporary fruit bestowed upon the unfaithful too. As satirist Mark Twain observed: the rain falls on both the just and the unjust as does the sunshine. So where is the real abundant life found? In a moment of light, he grasped the essence of truth without clinging to it himself. Real hope in God’s unending love and in the constant peace of His presence is the essence of abundant life. This hope for the moment, day, life now and life eternal – this real hope is the center of abundant life, life lived to the full with purpose and passion. Aren’t you tired of the enemy stealing, killing, and destroying your joy and your hope? Rest in the abundant life Jesus promises today. This entry was posted in Faith, Living With Purpose and Passion, Memories and tagged 2 Thessalonians 3:16, Abundant life, Isaiah 43:1-2, Jesus, John 10:10, Philippians 4:7, Psalm 33:18, real hope, Russian atheist, The enemy comes to steal kill and destroy, Unfailing love on June 23, 2014 by Bryan Thayer. Life guarantees troubles but you have a guarantee that God is with you in the midst of them. Doesn’t it make sense to be with HIM throughout your whole day? This entry was posted in Faith, Living With Purpose and Passion and tagged God is with you, Troubles on June 21, 2014 by Bryan Thayer. Being a light-bearer raises the bar for all fully devoted followers of Jesus. Even during the challenge of running the race we need to maintain a perspective of who we are – from God’s point of view. “Jesus loves me this I know” – we’ve been taught it from the beginning but do you believe it today? “For God so loved (insert your name here; also the name of someone who irritates you) that He gave his only begotten Son.” “The Lord takes pleasure in those who fear him – in those who hope in His steadfast love.” (Psalm 147:11) “He will rejoice over you with gladness.” (Zephaniah 3:17) “He brought me out into a broad place – he rescued me, because he delighted in me.” (Psalm 18:19) And the list goes on and on. It’s official: God loves you and delights in you. How can that be when we have so very many shortcomings? It is because God sees us as redeemed and made holy by the forgiving grace of His Son. As John Piper relates, “He sees us becoming in practice what we (already) are positionally in Christ.” Believe it or not, God loves you dearly. Put your troubles at the feet of that truth! Such an affirmation of our worth, our value to God could be a dangerous thing. We could (but better not) let our egos get puffed up and say, “Look who God loves.” It is a popular “me-centered gospel” preached too often today: ‘God delights in you and wants to favor you with all kinds of (materialistic) blessings.’ The truth is that God does delight in you but His favor may be evidenced by the hardships that draw you ever closer to Him. The best choice of how to respond to God’s amazing expression of love for us is to delight in Him. “Because your steadfast love is better than life, my lips will praise you.” Psalm 63:3. We are created to delight in God and to enjoy Him more than anything else. We are made to seek His presence throughout the rough parts of life and the mundane as well as the mountaintop experiences of great joy. It is our primary purpose. Delight in God, not just in His blessings. Delight in Him for who He is, not just what He has done. Even if nothing else is going ‘your way’, fill your day with your delight in Him who delights in us! This entry was posted in Faith, Living With Purpose and Passion, Relationships and tagged delight in God, God is always with you, Isaiah 43:1-2, John 3:16, John Piper, Light bearer, Psalm 147:11, Psalm 18:19, Psalm 63:3, Run the race, Zephaniah 3:17 on June 20, 2014 by Bryan Thayer. Are things going your way or God’s way? Admit it. You really like it when things go your way, don’t you? Me too. After a long arduous climb, it’s nice to take a rest on the mountain top and survey the beauty of the land around you. Whether it is friends and family getting along, finances sufficient to pay for your needs and some of your wants, good health, a beautiful day on your day off, a cool breeze on a hot day…it’s just nice when everything works out, isn’t it? But that’s not always the way it goes. I read a Facebook prayer request the other day that caught my attention. The person was saying they really needed prayers because “things really aren’t going my way lately.” In a rather insensitive moment, I thought to myself, “Welcome to the club. Life isn’t designed to always go our way.” I think the first chapter of Warren’s Purpose Driven Life book is called “It’s not about you!” And still, we often expect that things will go our way. In fact we spend much of our life attempting to achieve just that. The cartoon above shows the sojourner, a man just like you and me, standing at the crossroads of “Your way” and “Yahweh” (God’s way; good word play.) That’s just where you and I are every single day, and many times throughout the day. Making choices of which way we will go, deciding to say this or that, to mark our thoughts with nobility or with pride. Oh for sure, we aren’t always aware of the choice. We are so good at acting as creatures of habit, we go through much of life in a doze and on ‘autopilot.’ Like the old nursery song we need to ask, “Are you sleeping, are you sleeping, brother John?” Feel free to insert your own name. I have when I have found myself sleeping through parts of life. What are we to do at such times? Wake up. Let the light of God shine on you and rouse you from your sleepiness. “Wake up, sleeper, rise from the dead, and Christ will shine on you.” Ephesians 5:14 Choose YAHWEH/God’s way through the day. Even if it’s difficult it will surpass your way. This entry was posted in Faith, Living With Purpose and Passion and tagged Ephesians 5:14, God's light, It's not about you, Purpose Driven, sleeping through life, wake up, YAHWEH, your way on June 19, 2014 by Bryan Thayer.